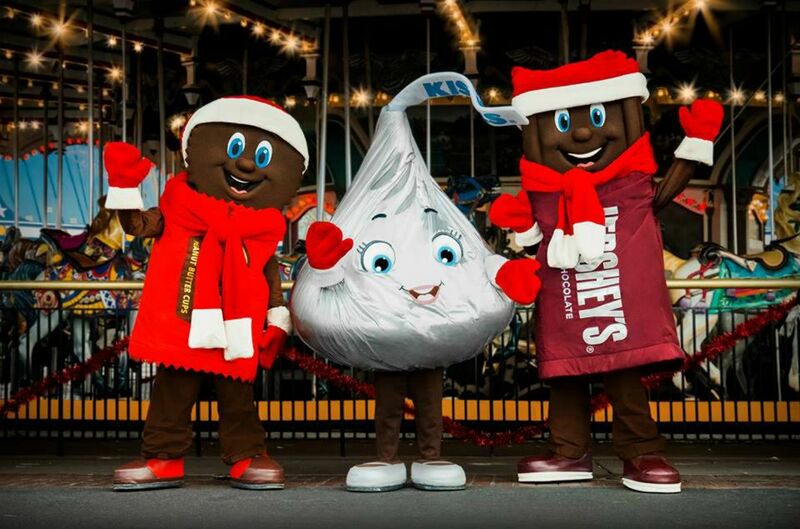 While Hershey, Penn., just two hours west of Philadelphia and three hours southwest of New York City, is a wildly popular place to visit year-round, it is an especially fun destination during the Christmas season. Many families will flock to the Hershey theme park or Hershey Chocolate World to see the holiday festivities. Make sure to plan your trip in advance as it can get quite busy with crowds. Along with the annual marquee holiday event at Hersheypark, there are Christmas shows and festive events at many other local attractions and hotels. Hersheypark Christmas Candylane: The theme park's big annual Christmas event features more than 4 million twinkling lights and 45 family and kiddie rides, along with Santa and his nine live reindeer. You can also expect to see choreographed light shows and festive live entertainment. The event usually runs from mid-November through January 1. The park is offering a special package on select dates that includes a one-night stay at the Hotel Hershey or Hershey Lodge resort, a one-day Hersheypark pass for the whole family, admission for one vehicle to the Hershey Sweet Lights display, complimentary milk and cookie delivery, and more. Hershey Sweet Lights: This holiday drive-through spectacular features nearly 600 illuminated, animated displays on almost two miles of wooded trails. Families return year after year for this holiday tradition. Sweet Lights will be open from mid-November through January 1. Little Elves Workshop: At the Hershey Story Museum, families can journey through the workshop and have fun using chocolate clay to roll out, cut, decorate and package their own unique ornaments. You can also play with some vintage toys and take a fun family holiday photo against a snowy Hershey backdrop. The workshop is from mid-November through January 1; tickets cost $5. Breakfast and Lunch with Santa: Join for breakfast or lunch with Santa at Hersheypark Place restaurant. Santa, Mrs. Claus, and their friends tell stories, sing songs, and present a special treat to each child 12 and younger. Seats sell out fast, so make a reservation early for weekends between Thanksgiving and Christmas. The breakfast menu includes your choice of scrambled eggs, chocolate chip pancakes, and bacon, served with breakfast potatoes or scrambled eggs with diced ham, scallions, green peppers, and shredded cheese, served with chocolate chip pancakes and hash browns. The lunch menu for adults features a breaded chicken sandwich with coleslaw and fries or a black angus cheeseburger or chicken caesar salad. The kid's menu has chicken tenders or a hot dog with fries, applesauce, and a fresh-baked cookie from Mrs. Claus' Kitchen. Live Music Shows: Each year, a selection of live music shows are performed during the Christmas holiday season at the Chevrolet Music Box Theatre. Typically, performances offer Christmas songs, wacky elves, prancing reindeer, and appearances from Santa himself. Noel: This light show features more than 250,000 dancing lights synchronized to your favorite Christmas music. There are four different shows every night starting at 5 p.m. and running every half hour. Besides the Hersheypark amusement park, there are plenty of other family-friendly events and activities nearby. It's worth checking out ZooAmerica North American Wildlife Park, the Dutch Wonderland family amusement park geared to younger kids, 30 minutes away in Pennsylvania Dutch country; The Hotel Hershey, a grand old hotel with a spa with chocolate treatments, of course; the Hershey's Chocolate World visitors' center that has a free Factory Tour, where kids package their own Hershey Kisses; and The Hershey Story, an interactive museum that tells Milton Hershey's life story and has fun classes in a Chocolate Lab. Luckily for November and December visitors, Hershey has a pretty moderate winter. Expect temps to be in the 30s to 40s with only a few days of snow or rain. You'll still want to pack typical winter wear (jackets, gloves, long pants, etc.) but you should be quite comfortable walking around the outdoor light displays and events over the holidays. What's New Hope, Pennsylvania Like for LGBT Travelers?